NO. OF PAGES: 1064 pp. SIZE OF THE BOOKS: 8.5” x 5.5” x 2”. PUBLISHER: Swami Jyotirmayananda, 38/1400, ‘H’ Block, 15th Main, Annanagar, Chennai-600040. PRINTER: Sudarsan Graphic Pvt. Ltd, No. 27, Neelakantha Mehta Street, T. Nagar, Chennai - 600 017. Commemorating the 150th Birth Anniversary of Swami Vivekananda (2013), the enlarged sixth edition of the book was released (on the 19th July) during the 26th Anniversary Celebrations of the ‘Arsha Vidya Gurukulam’ at Saylorsburg, PA, U.S.A. The first edition of the book was brought out in 1986, followed by the subsequent editions in 1988, 1992, 1993, and 2000 (vide the ‘Milestones in the Publication’. The book, extensively reviewed in the national and international media, has been well received and widely welcomed as a reference work on Swami Vivekananda. 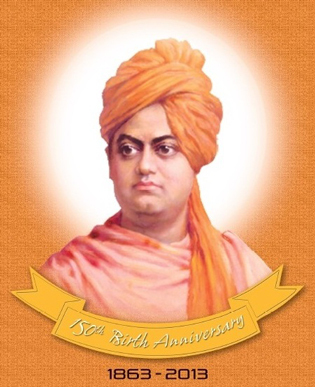 A DVD captioned: “In the sesquicentenary year of his Birth, remembering Swami Vivekananda, his unique contributions, and the lasting spiritual legacy to humanity” was also attached to the inner side of the back cover of the book. It is an audio-visual presentation of the book offered free of cost. The speciality of this new edition is that it carries a ‘Synoptic View’ of the whole book, and also a new chapter: “Winds of Change: Vivekananda and His Impact on the Western Mind (1893-2013)”. The new supplement, gives a brief picture of how far the Vedanta philosophy has influenced some of the greatest thinkers in the West, and through them how the thoughts have influenced many receptive minds there. The significance of this Section lies in the fact that it gives a bird's-eye view of the range of Swamiji’s success in the West. It reveals, in a nut-shell, the extent to which reputed American intellectuals have taken up the study of Vedanta and what a force they were in giving further thrust to the thought movement following Swamiji’s visit to America. Homage to Swami Vivekananda from Swami Ranganathananda, Messages from Sri Narendra Modi – an ardent devotee of Swami Vivekananda, and the Hon’ble Chief Minister of Gujarat, and Sri Rajiv Malhotra – author and Founder of ‘Infinity Foundation’, New Jersey, U. S. A, and Sri Tarun Vijay – author and Member of Parliament, give a fitting finale to the new part. ‘Vivekananda Literature’– the list appended to the book, now having been updated, contains the names of over 260 books by and on Swami Vivekananda, useful for further study on Swamiji. A couple of new appendices, including ‘What is Man-making’, given at the end of the book, will be found informative by the readers. “This book is an encyclopedic study of both these aspects – Swamiji’s influence on society and the impact of society on him. What sets this work apart from others of the same genre is the commendable effort by its editor to place Swamiji in the matrix of the socio-cultural milieu of the second half of the nineteenth century. The second part of the book, making up one-third of the entire work, presents a very interesting and comprehensive chronicle that puts the clock back by a century and half. The reader is taken through a fascinating journey from the time of Swamiji’s appearance on the world scene until his form disappeared from our mortal gaze. We live with Swamiji, taking note of every significant event in his life and, at the same time, observing major developments in every sphere of human activity – as Swamiji himself might have done, for he was very much alive to the happenings around him. We are brought face to face with political and religious leaders, savants, scientists, and so on, and weighty happenings in their lives that had hit headlines in those days. It must be admitted, however, that the task of spinning a backdrop to Swamiji’s role in the world from these diverse bare facts is left to the reader. in his review in ‘Prabuddha Bharata’, July 2013. & ‘The Free Press e-paper’, Aug 19, 2012.
in his review in ‘The Vedanta Kesari’, February 2013.
in his review in ‘India Tribune”, January 4, 2013. Read the Reviews in full here. Created by: Premier Technologies and maintained by Bharati Web Pvt Ltd.